Linksys, Buffalo and Netgear have all announced new Wi-Fi access points using the faster 802.11ac wireless internet standard. With 802.11ac, your Wi-Fi connection doesn't slow everything down to the speed of your slowest, oldest device; anything that can work at a faster Wi-Fi speed gets a faster connection to the access point. Not many devices actually have 802.11ac built in, so both Linksys and Netgear are bringing out USB adaptors. They're small enough to leave plugged into your notebook when you carry it around; the Linksys adaptor is barely larger than a paperclip. Netgear and Linksys are also offering apps you can run on your access point. Linksys Smart Wi-Fi shows you a map of all the devices on your network; add the Netproofer app and you can choose who can visit what sites and when. If the kids are supposed to be doing homework, you can turn off YouTube and Facebook on their iPads between 5pm and 7pm to encourage them to knuckle down to work, for example. The new version of Netgear's Genie EZ Mobile Connect app for Android can generate a QR code for logging onto your Wi-Fi network, so that if a friend visits and wants to use your network, they can scan the QR code on their phone or tablet to get online without you having to tell them the password. The app also has a Wi-Fi scanning mode so you can see the signal strength as you walk around the house, which helps you work out if you need to switch Wi-Fi channel or add a range extender for better coverage. Plus, Netgear has its own Genie+ app store with apps such as Symform (free cloud backup in exchange for sharing some disk space that Symform can use to back up fragments of other people's files) and a transcoding tool that improves the quality of video you watch using Skifta's media shifting service. There are 36 apps in the store so far, with several of them giving you remote access to files on your home network. Netgear says that over 300 developers are working on more apps. Belkin's WeMo Wi-Fi connected remote control enables you to turn any device plugged in through the power adaptor on and off from your iPhone or Android phone, and the new WeMo Switch enables you to do the same with your room lights. There's a motion sensor that can send you messages when it detects something, and the company promises more automation and remote control products in the next six months. But our favourite new Wi-Fi devices are the latest versions of Netgear's neat little VueZone Wi-Fi cameras, which run for six months on a camera battery. With no wires at all, you can just stick them on the wall and move them around to cover a new area. 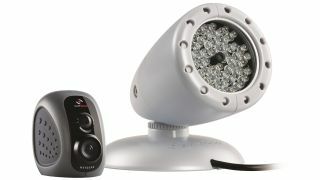 The new models have larger lenses and include motion detection. If you want to put one outside, there's a weatherproof case (and that does screw onto the wall so no-one can walk off with it). And because it's going to be dark out there some of the time, the latest VueZone camera is the Netgear VueZone Wireless Night Vision IP Camera with a separate infra-red lamp. Having the lamp separate means you can put the lighting where you need it - without burning out the image by having it too close to the camera. If you want a night vision camera inside the house (to keep an eye on your pets at night or to watch for movement that could be a burglar who hasn't turned on the lights), you can put the infra-red lamp discreetly behind the sofa and point it up to light the room.